From the very beginning I have never really understood the world we live in. The whole ‘work through your life, so you can then retire and enjoy life’ concept never made sense to me. Trudging every day through a nine to five existence, not really loving what you’re doing but doing it anyway. Retiring when your body is starting to get old, worn out and slowing down, just seems backward to me. Why not spend your young, strong and healthy years enjoying life, and along the way work out what you want to do when your body may be saying enough is enough? Why not remain working at something you love until the day you ‘kick the bucket’? When I was a child I remember expressing this confusion about life and work to family. My grandfather sternly told me, “You don’t have to enjoy work, you just have to go and do it”. To be fair, that sentiment is from the depression days and quite valid…for that time period… but we no longer live in those times defined by such hardship, and I certainly was not capable of understanding that perspective as a child. Obviously, if you’re reading this, you are fortunate to live in a part of the world where we members of society get a reasonable education. Perhaps, like me, you were free to pursue your education to what level feels right and was lucky to do so in what ever field desired. (It has taken a very long time, but I think I may now know what I want to do when I grow up…maybe). We then use that education to find a way to generate an income; be that as a tradesman, an office worker, at any level, or even a business or company owner. The object of this process is to find a lifestyle that suits us and then use that income to support that lifestyle. I guess this where my problems come in. When I was a young teenager, getting various pieces of advice about my upcoming and relentless future life, none of the traditional options were very appealing. In fact for the most part they were down right appalling to me. My dreams were focused around turn of the century mountain men, ringers, cowboys, sailors and surfers, canoeists…people living a life of adventure…adventurists. They lived their life according to their needs and wants, that world could be extremely harsh and challenging but also highly rewarding. Now, I realize that a lot of young kids have those kinds of fantasies, out of which they grow as their life continues into adulthood, but for me the desire to live that way has simply never left. I tried the expected pathway for a while. I tried the trade route at first, then went northwest Queensland working as ringer on cattle stations, after that I joined the military for six years. When I left the service I threw my saddle and swag in the back of my 4×4 and went back out to the northwest stations for a while. Man I even tried a little factory work now and then, but that was a whole new level of repetition and I always got itchy feet very quickly, and by quickly I mean within a couple of weeks. In fact the only jobs that I really look back on with fondness are the military and cattle station work, both heavily weighted on time spent deep in the wilderness and everyday was a new adventure. For example, my fondness of time spent in the military is largely due to the fact my unit was a mobile radar unit and we spent a great deal of the time in the field. Sometimes it felt like we spent more time under canvas or a hoochie than back home. It was very tough on the home-life, but for me being in the field was always a happy place. The station work also holds great memories for me; roaming the Australian outback…as vast as it is large…riding horses, chasing cattle and living in the vast bush environment. At times, days would be spent completely isolated, doing a repair or some maintenance on a water bore miles from the homestead… just you, the work and…nothing else. The isolation could be very intense at times, knowing there was no-one to rely on in the here and now. If something seriously bad happened, you would either live or die…simple. People would not begin to search for you until you didn’t return at the end of the day and with night approaching, plus not being exactly sure where you were, they may not even head out until the next day. I loved that. It felt good getting lonely every now and then. It made getting back to civilization feel very special. Living and working for a time in a remote area gives a perspective of the modern world that’s lacking when it’s in your face 24/7. There are truly ridiculous concepts that seem important when you’re completely immersed in society, but when you are away in the wilds, you discover that they really are not. Life becomes clear and simple. As I said, I tried living the ‘nine to five’ during the first part of my working life…I gave it good try for a while, then failed. When I reached the grand age of somewhere-around-thirty, I realized I was not being true to myself. I was trying to do what was expected of me, not what I needed to do to feel happy, stimulated and satisfied. So I built a couple of wooden sea kayaks, conceived and orchestrated a 2000 kilometer sea kayaking expedition up the Queensland coast of Australia, and journeyed for about three and half months from start to finish. 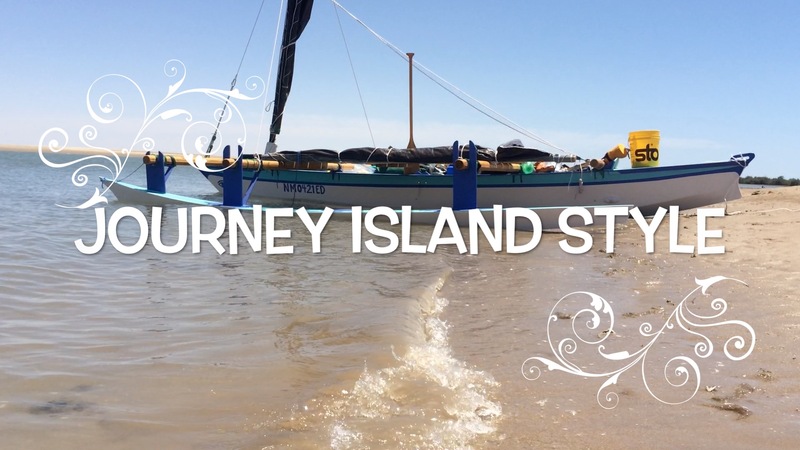 The journey was used to help raise awareness and funds for a charity I was involved with at the time, and from then on I was lost to an adventure-based life. You see, multiple months spent living out of a tent on beaches in remote locations, quickly became a lifestyle that truly appealed to me at my core. I found I had absolutely no desire to return to the ‘normal’ way of life. This was the beginning of a whole new chapter in my life; living, journeying and eventually teaching life skills in the great outdoors. Then we found a derelict boat in Australia, weeks away from being cut up and removed by the local council. It was a small Wharram-designed catamaran, a 24ish foot Hinemoa, that had been left to rot on the foreshore…one hull above the highest tide mark and the other floating with each high tide. We rescued this boat, rebuilt this boat and planned to journey in this boat. But life got in the way, as it so often does, and, long story short, we are now rebuilding a slightly bigger Wharram in the USA. If you’ve been following my posts on Facebook, YouTube, Instagram, or even directly on my blog, you’ll already know, but for those of you who are new to our story, this particular Wharram design is a model called the Tangaroa 35. We remain intent to journey to far flung places…hopefully around the world…with as many stops as we can squeeze in. In this way, the world is starting to make more sense to me. I’ve learned how important it is to follow your dreams and passions. I’ve spent much time discovering my dreams and passions. Now I am pursuing them to the best of my ability each and every day, and it’s the reason that I do what I do. Good on you, Mate, for living your life on your own terms. You and I have taken much different paths and that is what resonates for me – i.e. the difference is the similarity. Recently I was asked to be part of a panel to discuss my approach to living sustainably. The organizers were working on publicity for the event and asked me “so what are you?” referring presumably to my profession. They wanted to pigeon hole me but its not so easy. Through my life I have pursued many careers, on the surface usually unrelated, but with the underlying theme of “I did it my way”. Life is far too short to follow the crowd when there are so many exciting options to choose. So carry on doing what you do.